Microsoft Business Intelligence Services is a primary focus area at Teplar, being one of the leading BI suites in the current era. Gartner has recognized MSBI as a leader in the Magic Quadrant for Business Intelligence and Analytics Platforms. Power BI services are cloud-based business analytics service, facilitates anyone to visualize and analyze data with greater speed, efficiency and better understanding. Connecting users to a broad range of data via simplified dashboards and interactive Power BI reporting services, it offers data preparation and data discovery through a single design tool. Microsoft BI has prominence on self-service analysis and interactive data visualization via various devices like desktops, laptops, tablets and mobile phones. Data analytics is a process of inspecting, sanitizing, transforming, and modeling data with the goal of identifying useful information, informed conclusions, and supporting decision-making. It is a one kind of business intelligence that is now used for maximizing profits and making better use of resources. Transforming your data into rich visuals, Microsoft Power BI is a customizable data visualization tool set that gives you a complete view of your business. Create and share reports inside and outside your organization, spot trends as they happen, and stay focused on what matters most. Our Power BI consultants at Teplar use their expert knowledge of data to empower clients by enabling them to have comprehensive business intelligence solutions from data silos to data discovery that create a full picture of corporate initiatives and improve business decision making process. Microsoft has separate products for data integration (SQL Server Integration Services - SSIS), analytics (SQL Server Analytic Services - SSAS), business intelligence (SQL Server Reporting Services - SSRS), and visualization. Predictive analytics is the mechanism of extracting information from existing data sets in order to identify patterns and predict future outcomes and trends. Predictive analytics is predicting future events by using historical data. At Teplar, we have expertise to build enterprise cloud enabled Power BI with Azure Services. Azure and Power BI have the fundamental connectivity to bring your business intelligence to real life in perfect way. Why TEPLAR for Power BI Development? Confirming a important balance between Cost, Scope and Time for every effort, keeping excellence as the laeder is our motto. 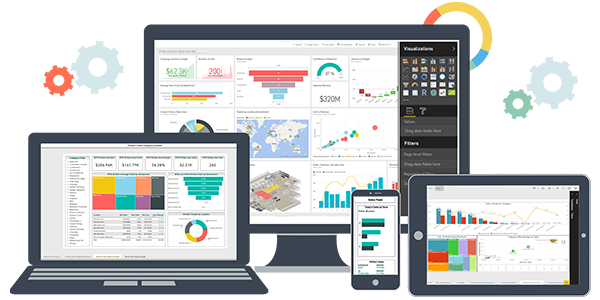 The Microsoft team at Teplar has ample expertise in Power BI dashboard designing & Power BI reports, which are core products. We have multiple successful projects implemented across the world, involving all latest technologies and practices. As your IT partner, our service vision is 24x7x365 SLA based quality driven support, wherein we have great successful experience in SLA driven support areas.